Meet the mythical monsters from Ancient Greece! Greek ‘myths’ (short for mythology) are a series of stories about the Gods and magical beings of Greece. We’ll bet you’ve heard of some of the famous – and infamous! – characters already, such as Heracles, (the strongest man on Earth) Zeus, (the God of the sky and king of the gods) Pegasus (a flying horse) and Hades (the god of the underworld). Find out more about the grand Greek myths, below! Created thousands of years ago, Greek myths were epic stories about Greek gods, passed down over generations. They often feature heroic battles and terrible creatures, and taught the importance of bravery, intelligence, and right and wrong. They showed that even the gods, like mortal men, could be punished or rewarded for their actions. Details of the ancient tales have been found on everything from pottery to temples to stone statues! Greek myths were a huge part of the religion in Ancient Greece, and offer a glimpse into the lives of the ancient people who told them. 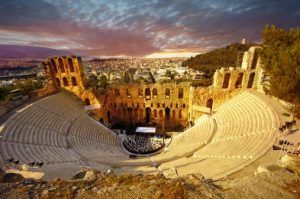 Check out five of these fascinating Greek myths below, and meet the people-eating, fire-breathing beasts and the heroes who battled them! The Battle: On both sides of a narrow stretch of sea, monsters lie in wait. On one side, Scylla thrashes around her six snakelike heads, ready to crunch on passing sailors. On the other, Charybdis creates a deadly whirlpool. No person has ever faced these beasts and escaped unharmed. Now the king, Odysseus, and his crew must pass them to get home. They edge around Charybdis’ spiralling sea, saving the ship from being swallowed whole. But Scylla swoops down and gobbles up six men. “Row!” Odysseus shouts, leading the rest of the crew past Scylla and out of the deadly channel. Having survived the dreaded beasts, Odysseus and his men continue their journey. 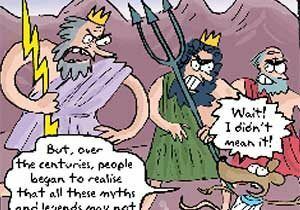 Did you know we have a FREE downloadable Greek Mythology primary resource? Great for teachers, homeschoolers and parents alike! The Battle: Half-man, half-bull, the Minotaur lurks in an underground maze waiting for his next meal – children sent to him as a sacrifice. Lost in the labyrinth, the kids surely will be devoured. But brave king Theseus has had enough of his land living in fear of the Minotaur. He accompanies the group and is prepared to fight. Hearing the Minotaur breathing nearby, he springs toward it. Dodging the monster’s deadly horns, he thrusts his sword into the beast. The Minotaur is dead, but will the group find its way out? Luckily, Theseus unspooled a piece of string as he walked through the maze, and leads the children out to safety. The Battle: In a swamp creeps a deadly nine-headed serpent called the Hydra. Killing it is one of 12 tasks Heracles – the son of Greek god, Zeus – must complete to become immortal. After throwing flaming spears at the beast, the Hydra attacks so Heracles hits its heads with a club, but more grow in their place! Heracles’ friend, Iolus, then leaps to his aid with a flaming torch. After an epic battle, the men finally destroy the Hydra! The Battle: The hideous Medusa has snakes for hair, terrifying tusks and a face that turns anyone that looks at it into stone! To please his king, warrior Perseus agrees to slay the beast. Wearing a helmet of invisibility, he sneaks up on Medusa. She’s asleep, but one gaze at her face and Perseus would be a statue! So he looks at her harmless reflection in his shiny shield and beheads her. Victorious, Perseus flies off on winged sandals. The Battle: The fire-breathing Chimera is a terrifying beast with a serpent for a tail, a goat’s body and a lion’s head! A king has commanded warrior, Bellerophon, to destroy her. Soaring above the monster on a winged horse, Pegasus, he shoots arrows at her. Bellerophon then attaches lead to his spear and thrusts it into the vicious beast. The hero’s actions kills the fiery Chimera. Read more about amazing ancient adventures in National Geographic Treasury of Greek Mythology. Did you know we have a FREE downloadable primary resource about the Lost City of Atlantis? Perfect for teachers, homeschoolers and parents alike, the resource investigates the legendary Ancient Greek island swallowed by the sea! What do you make of our Greek myths? Let us know by leaving a comment, below! AAAARRRRRRRRRRRRGGGHHHHHHH!! Those myths are so scary. This is so helpful school is had some times and this web site help a lot. the Scylla was the coolest monster ever!!!!!!!!!!!!!!!!!!!!!!!!!! great for learning and very educational! there is no information i need where is stuff about GREEK THEATER!?!?!? Nice myth stuff it helps a lot! It is very dong like! It is very helpful for home work! THE MINOTAUR HELPED ME DO A GOOD REPORT IN SCHOOL!!!!!!! Im proboly gonna get top marks at my school !!!!!!!!!! I know a million more and the stuff here isnt all right. Im doing a social studies project on ancient Greece. These myths are awesome! These are really great myths! i loved what you did with the article being in third grade and focusing on writing i love it. Interesting info. Another Greek monster is a Siren that is kind of like a mermaid.Its songs lure sailors to misguide their ship so then it sinks. This was pretty cool. hoping for a link with greek gods though. It did not tell me about aprohdiite. this is an amazing avatar you have to agre. medusa has sisters you know. That myth quite scary. WOW! THIS WEBSITE GIVES ALL GREEK INFORMATION. GREAT! Wow! those facts are so cool. wow amazing! where did you learn all these myths from? national geographic is the best!5 star! Thank you, you might have just saved my bacon. it is so good and I love the pics! It is helpfull for homework♦?? That is just what I wanted!! That was so cool!!! Just add more stuff maybe? this was weird why no Percy Jackson? This article is just FABULOUS!!!!! Isnt Kratos a God? I thought he was the God of war? these are very interesting stories, my only suggestion is to make them a tiny bit longer? That would be really cool! I AM FINISHING UP MY GREEK MYTHS UNIT IN SCHOOL ! I cant believe that I was named after a greek monster that can turn people into stone, just by looking at them in the eye. JONAS! These are the greek monsters, not the percy Jackson ones. PLEASE PUT SOME PERCY JACKSON STUFF ON HERE ! this stuff is so cool!!!!!!!!!!!!!!!!!!!!!!!!!!!!!!!!!!!!!!!!!!!!!!!!! Im doing a project on myths and this is very useful for part of it. LOVE THE ANCIENT GREEKS MY FAVE TOPIC EVER. STUDYING THEM NOW. DID YOU KNOW MILETUS WAS A GREEK CITY EVEN THOUGH IT WAS ON THE COAST OF ASIA MINOR? My favorite myth is the Minotaur. National Geographic for kids I has a lot of info about things.That is why I am on here a lot! I really loved learning about Greek Mythology. Thanks! Thanks my English project is on Greek myths and legends. You helped me so much. I really like the drawings and the story of mercury and madousa. I like the stories that are on here. These stories were awsome and I know all of them but it does not hurt to read again. my favourite was the minotaur and medusa because I already knew about those. I just finished the greeks in school the romans is next I like greek history. its not my favourite but its my second favourite my little brothers favourite is the ancient egyptians but ive already done ancient egyptians before the ancient greeks. i know all these heros! you guys should try and read the percy jackson series. I WANT MOOOOOOOOOOOOOOOOOOOOOOOOOORE!!!!!!!!!!!!!!!!!!!!!!!!!!!!!!!!!!!!!!!!!!!!!!!!!!!!!!!!!!!!!!!!!!!!!!!!!!!!!!!!!!!!!!!!!!!!!!!!!!!!!!!!!!!!!!!!!!!!!!!!!!!!!!!!!!!!!!!!!!!!!!!!!!!!!!!!!!!!!!!!!!!!!!!!!!!!!!!!!!!!!!!!!!!!!!!!!!!!!!!!!!!!!!!!!!!!!!!!!!!!!!!!!!!!!!!!!!! I LIKE IT , ITS NOT SCARY!!!!!!!!!!!!!!!!!!!!! The Gods and Goddesses of Ancient Greece! 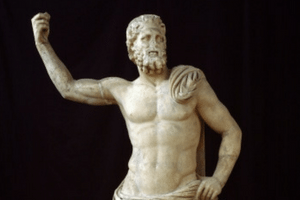 Meet the gods and goddesses of Ancient Greece!